At guide camp I’ve learnt that, if the night has been dry and quiet, sometimes the embers of yesterday’s fire can be re-kindled in the morning. It usually takes a lot of puff, or even vigorous fanning, as will as some dry twigs. On the last, but blessedly dry, morning of last summer’s camp I was first up and could feel warmth in the embers in the fire pit. 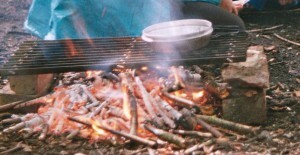 So I fetched my bag of dry leaves and twigs from the store tent, along with a tray to fan the first tentative flames. As I placed the first twigs on the embers, a curl of smoke rose. 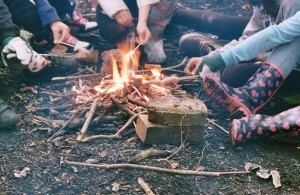 I was amazed, but calmly added a few more sticks and soon had a flame, more sticks and then a fire. Then the kettle. In the right place, at the right time, kindling a fire is an easy thing to do. At other times, as I observed above, it can take a lot of breath and determination. Some days, when the weather is damp it is very difficult, and other days it may prove impossible. On the morning quoted above I was as thrilled as the young guide the evening before who had lit a fire for the first time (and she’d been to scared to even light a match previously). I also knew that in a couple of month’s time I’d be attending the ‘Kindlers’ conference at Woodbrooke. This experience made the metaphor of ‘kindling’ was very real to me. The ‘Kindlers’ are an informal Quaker group working to rekindle the depth and passsion of Quaker worship. Their workshops encourage a greater awareness of what we are doing in worship, increased knowledge as to how to do it (instead of assuming that we’ll all just pick it up as we go along) and a deeper level of sharing than most people are used to. I find that I come away from a workshop enthused to share something of the experience with others. If we all do that then the fire will spread. In the process of being a Quaker and a Buddhist, I find myself asking if there is a place for some ‘kindling’ amongst the Buddhists I know, as well as amongst the Quakers. I sense that there could be, but I’ll remember to breathe mindfully as I blow on the warm embers! Karma, that’s a good Buddhist word and it begins with K – maybe I’ll write about that this week. That’ll be easy. Except that I have a problem with karma. I just don’t believe in it at all. It makes perfect sense to me that what we do now affects what happens later. Simple cause and effect. Or, in most cases, not quite so simple, because most things in life are over-determined – caused by more than one factor. What I don’t believe is that anything I’ve done in a past life is having an effect on my present life. I certainly don’t believe that the illnesses and other troubles I have and have had are caused by something bad I did in a previous life (or even in this one). I believe that these problems just are. Stuff happens, end of. Why? In part because I don’t believe in past lives or future lives. This life is the only one I’ve got. I know a lot of people who believe otherwise and it really matters to them. That’s fine, and they may be right. But, as far as I’m concerned, when I die my atoms are going back into the universe (though hopefully some are going via the MS Tissue Bank). Just the same way they are swapping in and out of me all the time. Sometimes me, sometimes not me. And the universe just goes on. Earth quakes quake. Storms wreak havoc. Floods soak and drown. The sun shines. Heatwaves happen. None of this is wrought by the hand of an angry god. None of it is caused by what the individuals who suffer it’s effects did in their non-existent past lives. It may, at least in part, be caused by what human beings have done in the past. I do, for instance, believe in climate change and I do believe that human activity is a factor in it. I also believe that we might be able to reduce it’s effects by the actions we take now. At least we need to try. I do my best to do the right thing now, for myself, but also for the community, the human race, the planet. Well, at least as far as I can figure out what that is. My incentive is just because that is the right thing to do, and because that way aligns me with that positive, loving, creative force that I call God. And if it is true that my positive actions in this life will generate good karma that’s all to the good. Even if I don’t believe in it. I had plenty of ideas lined up for this second J in my Buddhist Quaker alphabet, but somehow none of them was quite becoming a post. None got further that a sentence or two. Not that I’m aiming at any great length, but it needs to say something to make it worth posting. Then, as I sat in meeting last Sunday, I saw these words, these happening to begin with J words, as being a jumble, like a jumble of threads in the mess my sewing basket sometimes is, or the mess we used to see when emptying out the bags of donations for our annual guide jumble sale. When the jumble was sorted there would be a very few gems, lots of could be useful to somebodies, and loads of probably complete rubbish. But it was always hard to be sure quite what might sell. What’s rubbish to one person could be just what is needed to another. Sometimes my spiritual life is like that pile of jumble waiting to be sorted. So many ideas coming in, from many different sources, that I can’t see any way forward. But time and patience, looking at each one, maybe trying it for size for a while, eventually create some degree of apparent order. Until someone (probably me), accidentally or deliberately, tips the table over …. This well-known quotation, attributed to St Teresa of Avila, summarises much of how I feel Jesus (or Christ or God, if those names sit more comfortably with you) acts through us in the world. If I am to follow his example, simply by reading about his life and applying that example in my own, I would be doing this. That is one way I can understand being a Jesus-follower, a way of being christian. There are also times when I feel that something else, whether from within me or from outside me, but somehow not actually me, is acting through me. In my Quaker understanding I describe that ‘something else’ as ‘that of God’. Recently at a ‘morning of mindfulness‘ in the tradition of Thich Nhat Hanh, someone requested that we chant ‘Namo‘valokiteshvaraya’. There were some newcomers to the tradition with us, so an explanation of this was offered. The chanting invokes the bodhisattva Avalokitesvara, the bodhisattva of compassion, who is said to manifest whenever someone needs, or asks for, help, in whatever form is most helpful. In Chinese this bodhisattva is known as Kuan Yin and is reputed to always manifest in female form. I found the explanation helpful in several ways, in part because I had not previously understood, in language or ‘head’ terms what we were doing when we chanted. But also because the explanation continued by saying that we need not see the invocation as literally invoking a separate being, but that it could be understood as invoking something within us. This gave me a clearer image of something I’d vaguely seen before. Anyone could, at any time, be (however briefly) a bodhisattva. Avalokitesvara could look out through your eyes and my eyes, could use your feet and my feet to go to were the need was, could use my hands and your hands to do what needed to be done. We can help the person who has fallen in the street, we can listen to the person in distress, we can feed someone who is hungry (directly, or by contributing to a food bank, or by sending money to an appropriate charity), we can help one another in all manner of ways, large and small. We can allow that inner bodhisattva to manifest through us. So I came back to Christ, to Jesus. I also came back to the necessity that I act. I can pray or chant or listen to ‘the promptings of love and truth‘. If I allow compassion to waken in me, I will be moved to act. If I act in line with, in tune with, ‘that of God’ or that inner bodhisattva, I will, hopefully, be acting for the best. On this particular occasion,at that morning of mindfulness, I chanted, holding in the light my friend Stephen whom I knew, from his text messages, to be very ill with bowel cancer. I had replied to his texts offering my thoughts and prayers. In the circumstances I could offer little else, I wished I could. I heard, about a week later, that he had died only days after that chanting. I hope he felt upheld by it, as I had done on a previous occasion. I hope he is freed now from the slightly desperate searching that was so much a part of his life in the time I knew him. I give thanks that we shared a part of our spiritual quest, that we had spent some time together fairly recently and that we had remained in contact, however tenuously. I am a water molecule. I’m here in this raindrop with my siblings, surrounded by all these other raindrops. Any time now we’ll be hurling down, down, into another adventure. Yesterday I was calmly resting in a lake, having tumbled down a mountainside in a stream a few days earlier. I was enjoying the peaceful interlude. The sun shone hotter and hotter as the day went on, my fellow molecules were gradually sucked up into the air. Soon enough it was my turn. Up, up, into the clouds. In the cloud we cling together in little droplets, until we are just too heavy to hang up here any longer. Then it’s down, down to another adventure. Where will I go this time? Into a plant becoming part of a cell for a while? Or into a mammal’s lungs to sit about in that moist environment until I am exhaled again? Or drunk in a glass of water to be absorbed and used by that body, until that, too, ejects me, perhaps as a tear? Every thing, every constituent part of our bodies, of what seems to make up the permanent stuff of our selves, has been part of all sorts of other things in the universe, and will cease to be part of us and go to be part of something else, while all the time we may think that we continue to be the same ‘self’. We are all intrinsically part of the universe and it is part of us. We all interbe with everything. I follow the science of the water cycle. I know intellectually that all my molecules are only ‘mine’ temporarily, and that they are mostly empty space. I find it harder to grasp in my inmost self (made of entirely of stuff that is not ‘myself’) that I interam with every thing, every plant, every animal, every person. That I am the mayfly, I am the bird, I am the homeless person sleeping in the street doorway. That I am the arms dealer (arms dealer, surely not – I’m a Quaker, we don’t trade in arms – or do we? ), I am the flower bud, the rose, the thorn, the cancer cell, because we all inter are. But I’m cultivating this insight, so that compassion may grow in me. Having already tackled greed and hatred in this Quaker Buddhist alphabet, it seems appropriate to take the third of the three poisons next, so here is I for ignorance. Like the other terms in this list, the sanskrit source word can be translated in various ways: confusion, bewilderment, delusion and sometimes, stupidity. These help us to gain a sense of the breadth of meaning in the original word and stop us getting to stuck on one particular interpretation. So how can we dispel ignorance? I think it needs to be tackled in lots of ways. We can read and study, using our brains and our analytical, logical thinking. This lets us learn on one level, but I can repeat the four noble truths and write them on my exam paper, without them making any impact on the way I live my life. So book-learning and study and listening to dharma talks are not enough on their own. I also need to practice the teaching, apply it in my life. Live the noble eightfold path, follow the five mindfulness trainings, coming back to read them from time to time to remind myself of them. Not a big problem in that I always understood that to follow Christianity I should be living as Jesus taught, following his example. I found, among Quakers, people who were doing that, as best they could, without getting bogged down in unnecessary rituals. Following the Quaker way, accepting the guidance of Advices and Queries, and keeping the five mindfulness trainings, all seem to amount to the same things on a day to day basis. Only a big problem in that to do this properly is a huge challenge, I continually fail to do as well as I aspire to. ‘I will not kill’ says the mindfulness training – clear commitment, easy, until there are ants in my kitchen. I squash them. There’s a slug on my lettuce when I come to wash it, I carefully take it outside and let it go, but I used slug pellets on the allotment earlier in the day (albeit they were organic gardening approved for occasional use). I’m a vegetarian, but is my pension fund investing in arms manufacturers? Do I know, can I make the effort to find out? What about the ignorance of others? Should we share this message, and if so how? Buddhism has the concept of ‘skilful means’, that teaching needs to be in a way the recipient will understand. So I can share my practice and my understanding in different ways. I might explain to a colleague who tends to trip and fall, how practising mindful walking helps me to avoid falling over, and to another that taking three breaths before answering the ringing telephone makes me much more patient with the caller. To someone else I may comment how practising mindful walking has increased my compassion for the people who live in my neighbourhood, how being in the here and now makes me more aware of those living immediately around me. With my guides I provide short readings at the close of meetings, that hopefully provoke thought about the spiritual aspects of life. To a fellow Quaker I may explain how practising silent meditation and mindful breathing on a (nearly) daily basis makes it easier to settle into the silence of meeting for worship. Or I could write a blog about my experiences in trying to live this Quaker Buddhist path.